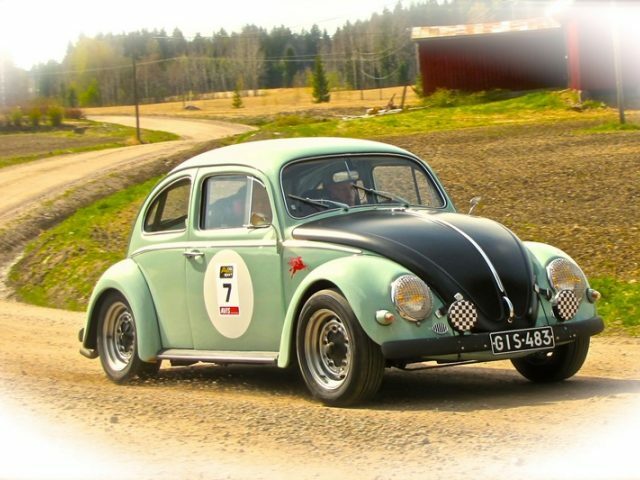 On offer is a professionally built classic VW Beetle 1964. The chassis and shell have been sandblasted separately, new floor pan fitted and painted during 2012. The car has been purpose built for regularity rallying. Everything on this car has been merely run in and it is ready to race. The VW is road registered in Finland with valid EU MOT. professionally built 1600cc rally engine with 115 hp. Motor has been finished to a very high standard, blueprinted and adjusted. It is equipped with genuine Weber 44 IFDs, lightweight pistons, Kennedy Stage 1 clutch setup, electronic 009 ignition, Bosch blue coil, correct ignition leads and spark plugs. Engine has done only 500 km of road use, and is not yet run in. Starter motor is a high torque version used for high compression engines, with only 1000 km. All other ancillaries are nearly new as well. The car has been converted to 12V electricity. Engine tin and exhaust are all new and in perfect condition. Heat exchangers are in place and in working order. Engine has plenty of torque from below 2000 rpm and revs happily to 6000 rpm if needed. Ideal for regularity rallies for speeds between 30-50 mph where the car can be driven in 3rd gear even up steep inclines. Rancho Pro Street transmission with standard gearing. Short shift kit. Only 1000 km. The car is equipped with powerful disc brakes all round. Only 1000 km. Front has been rebuilt using a strong, original front axle, new bushings, control arms and adjustable Koni Red shock absorbers. Steer shock absorber. Rear axle is standard but with new bushings, KYB gas shock absorbers, set two clicks lower than standard. Wheels are new 5,5X15 Porsche 356 replica steel wheels, painted silver. Tyres are new Falken Eurowinter friction rubber 185/65R15, ideal for gravel, wet tarmac and snow and work great also on dry tarmac. An unused set of spiked winter tyres comes with the car on standard VW steel wheels: Hankook IcePeak in 165R15. All tyres have been balanced and set up professionally. Everything is either brand new or used only 1000 km since installation in 2012. Stripped interior but with some basic black carpeting in the front footwells. Sparco classic bucket seats in black cloth. Sparco four point harnesses. Momo Prototipo leather steering wheel with a hub extension bringing the steering wheel close to the driver. New door cards. Autometer tacho with shift light. Audi quattro instruments for oil pressure, oil temperature and voltage. Bosch main cut off switch between the seats. Rebuilt VW speedo. Wiechers Sport clubsport custom rollbar. CSP adjustable windscreen wiper speed system. Fire extinguisher bolted in front of the co-pilot seat. Rare Halda Twinmaster trip in perfect working order and cosmetic condition. Vintage driving lights with "Bosch LeMans" vintage NOS covers. Headlight grilles. Front hood painted satin black. A brand new spare engine (1680cc with dual Dellorto DLRA 40s) with zero km can be delivered with the car, as do spiked winter tyres. The car has a FIA regularity rally pass. This car is ready to race at any FIA regularity event and and ideal car to participate in the Monte Carlo Historique without breaking the bank. It's reliable, extremely nimble and fun to drive. It is a classic shape and a real crowd pleaser at any event. The car is located in Finland and any inspection is welcome. Delivery to mainland Europe or the UK can be organized at extra cost. Photos can be emailed for serious buyer candidates.